whilst browsing the Paradors... minimise to continue. From the Rias of Galicia to the Pyrenees, the northern region of Spain contains an enormous variety of landscapes, a wealth of popular traditions and a rich gastronomy. On this route, smooth plains and dramatic mountains meet a sea with lovely beaches and extraordinary cliffs. The Romans built a road that joined the North and South of Spain and which would come to be called the Silver Route. To be found along the Route are cities and villages that possess an important cultural legacy. Here we present the most famous section of the Way of Saint James, used on pilgrimages to Santiago de Compostela. The Pyrenees Mountains form an immensely beautiful, natural border where water, rocks, plains, forests, mountains and valleys are the true protagonists, together with the monasteries, villages, Romanesque churches and cities that dot the region. 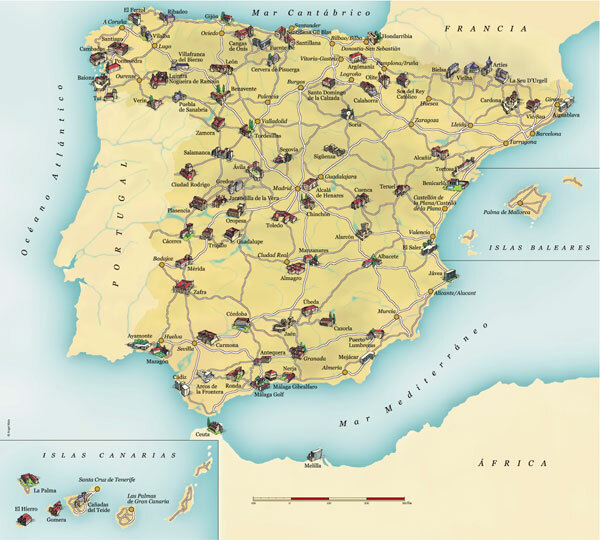 These monasteries were founded by the Kings and Queens of Spain. In addition to being living monasteries and convents, they conserve their original founding spirit and contain extraordinary collections of art: The Descalzas Reales and La Encarnación in Madrid, El Escorial, Santa Clara de Tordesillas, and Las Huelgas in Burgos can be seen on this route. 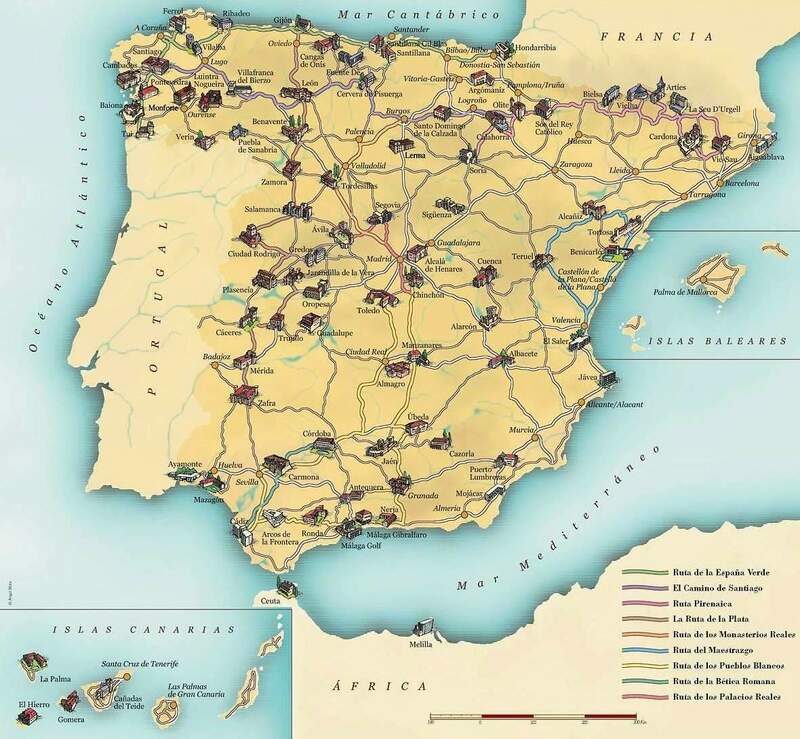 The Maestrazgo, lands through which diverse cultures have passed (Iberians, Visigoths, Romans and Arabs), presents us with the opportunity to discover walled cities, old palaces, castles and ancient fortresses, together with peaceful streets and plazas that are a testament to the cities' former grandeur. There are many, many white villages to be found in Andalusia, under the blazing midday sun or the moon's brightness. The Via Augusta was a fundamental link in the transport routes of the Roman era. The Via was also the backbone of transport for the Betica province. From Cordoba to Tarifa, with this route Paradores suggests a way to get a glimpse into the culture of that era. This route allows guests to see the royal palaces and historic gardens of Madrid, Aranjuez, El Pardo, La Granja and Riofrío. These sites are still used by the Spanish royal family for institutional activities and, due to their exceptional historical value, are open to the public, who are invited to enjoy their monumental, historic and artistic grandeur. The routes we suggest here are just a few of the possibilities that Spain's Paradores have to offer. There are many more ways in which you can organize your own route… your own personal journey.